After graduating from Washburn University with a degree in business and finance, Gene signed a free agent contract with the Pittsburgh Steelers. Three years later, Gene signed with the Green Bay Packers who allocated him to the Montreal Machine of the World Football League. 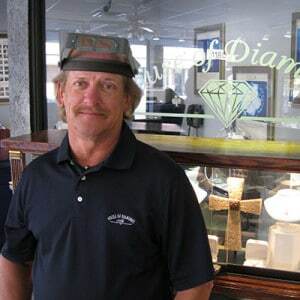 After being released from the Packers, Gene began his career in the jewelry industry. Gene spent less than a year working for an independent jeweler in Topeka, KS before moving to Kansas City. 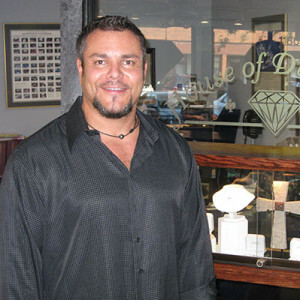 He managed a prominent Kansas City jewelry store before deciding to start House of Diamonds in 1995. Gene recognized an opportunity for a true custom design and manufacturing facility. His passion for the design and manufacturing side of the jewelry business drove him to build a store with an emphasis on traditional jewelry craft and the exciting new technologies emerging in our industry. Gene also has an education from the Gemological Institute of America. Gene is married to Karen and they have three daughters, Alexis, Reagan and Tallia. 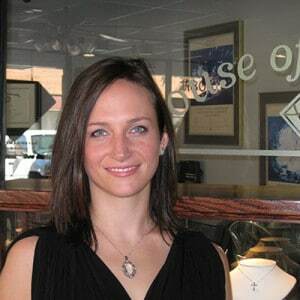 Karen started her love of jewelry design in high school at Shawnee Mission East with Mr. Crawford. While at Shawnee Mission East she earned a national award for one of her pieces. Following high school, Karen went to the University of New Mexico for a year, and then continued her education at the University of Kansas where she studied Metal-smithing and Jewelry Design. Karen designs all of House of Diamonds custom work on a CAD system, and then creates the models utilizing our two model machines. Her long-time passion of jewelry and design are a great asset to House of Diamonds, and the custom design process. Karen and her husband Gene have three beautiful daughters, Alexis, Reagan and Tallia, whom you will most likely see the next time you visit the store. She loves the outdoors, and enjoys swimming and fishing with her family. Bob was introduced to the jewelry industry by his brother, who is also a jeweler. His training was hands-on, learning from his brother, and then apprenticing under several master jewelers. Bob currently has over 33 years of experience, and has an extraordinarily broad skill base ranging from antique repair and refurbishment, to the most cutting edge of jewelry making techniques. At House of Diamonds Bob performs all of our precious metal casting, drawing from over 30 years of centrifugal casting experience, and integrating it with our state-of-the-art computerized casting operations. Bob also spends his free time on his farm and enjoys hunting. Corey is a native of Kansas, born and raised in Hutchinson. Having an interest in the craft of jewelry making Corey attended the KU’s Metal arts school where his interest of jewelry and the art grew from an interest to a passion. 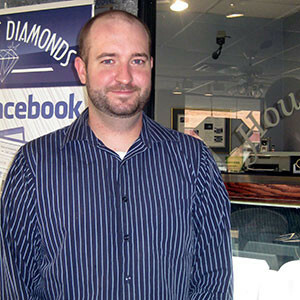 Corey continued his education by attending the Texas Institute of Jewelry Technology in Paris Texas. After Graduating, Corey returned to Kansas to develop his career. Corey has been awarded with the Stuller Platinum Award and Stuller Gold Award! When Corey is not refining his jewelry making skills he enjoys hunting, fishing, and playing softball. John-Paul “JP” Weir joined the House of Diamonds staff in November 2015. A recent graduate from The University of Kansas School of Business, JP carries a strong passion towards Business Development, Public Relations and helping House of Diamonds excel. 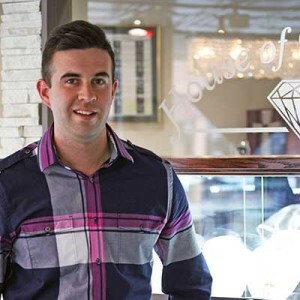 With his passion and desire to grow in the industry, JP will be pursuing a Graduate Gemologist degree from The Gemological Institute of America. When JP isn’t in the office you can find JP spending time with his family, on the golf course, dining out, or simply cheering on his favorite sports team. If you see JP out and about don’t be a stranger, he loves meeting new people.